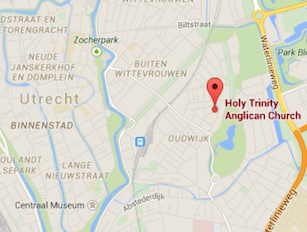 There is now an Anglican Church in Groningen! We welcome all who, like us, desire to worship, learn more about, and serve God, and explore the life, mission and ministry of his Son, Jesus Christ, that continues, in his Spirit, through his followers today. A very short history of our church, as we have just begun, is found below the map. 2nd Sundays of the month, at 10:30 am: Service of the Word. Location: the Old Catholic Church (Witte de Withstraat 2, Groningen) (see below). We also have social activities and Bible studies. In 2011, Archdeacon John de Wit licensed Sam Van Leer, former Chaplain to the East Netherlands, as an Associate Chaplain of Holy Trinity Utrecht, with special responsibility for Groningen. In August 2011, Sam and family moved north to explore starting a new Anglican congregation in the largest city of the 3 northern provinces of the Netherlands. Early contacts with the Groningen university community proved fruitful, especially with the GSp (Groninger Studentenplatform voor levensbeschouwing) and HOST, an IFES-sponsored Christian student organization dedicated to welcoming and offering hospitality to international students. After starting with worship in the Van Leer household in early 2012, from late November of that year, our growing group began gathering in Groningen city itself, thanks to the hospitality of the GSp. Anglican-style worship was offered twice monthly, with fellowship and Bible study at other times. In 2013, the group adopted the name ‘Grace’ (Groningen Anglican Church), and in July 2014, selected a Leadership Team to facilitate planning for growth. From September 2014, the Old Catholic Church in Groningen welcomed the Grace Church congregation to make use of its beautiful, new church building in the city centre, and Grace Church established itself as a kerkgenootschap under the auspices of the Anglican Church in the Netherlands. Throughout these early developments, Grace Church has been deeply blessed by the dedication and enthusiasm of its new members, the prayers, support, and advice of Holy Trinity Utrecht, the Anglican Church in the Netherlands and the Diocese in Europe, and, above, all, the grace of God.